My mother is one of the most adorable people you will ever have the pleasure of meeting. She's like homemade bread straight out of the oven– warm, comforting and often covered in flour. She loves babies, coffee and flannel. Probably in that order. Her laughter is infectious and her shoe collection enviable. "Hi everyone,In light of our friend/neighbor dying in Mexico this week a thought I have been wanting to share with you and Dad feels the same way is the following. If either of us dies in Colorado– our wish is to be cremated in Colorado. Neither of our dead bodies will be flying in the sky to Va. I am not planning of dying anytime soon but I wanted to make you aware of our wishes.Love mom"
My sister Laura responded to Mom's text with a "LOL". 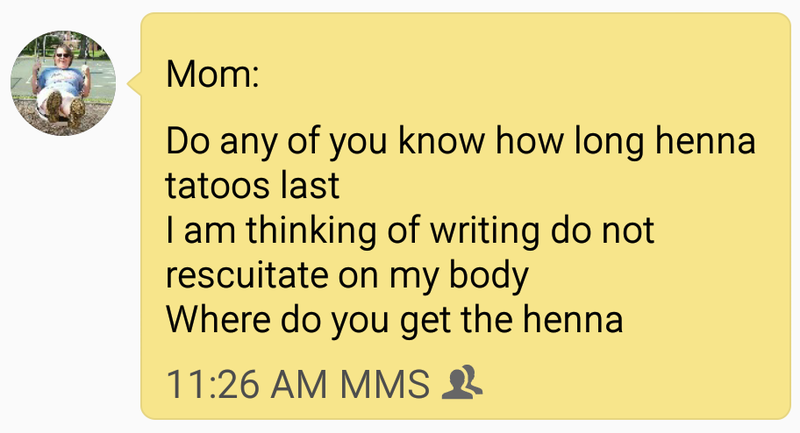 Sarah, who's an amazing henna artist, offered mom advice on what type of henna to buy and where to get it. 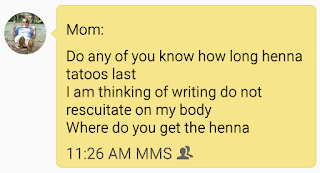 I suggested she consider getting an actual tattoo– you know to save her the trouble of reapplying the henna every couple weeks. 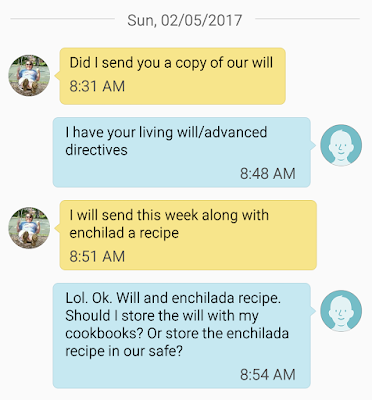 Mom is 70. She's active, eats well and is in good health. 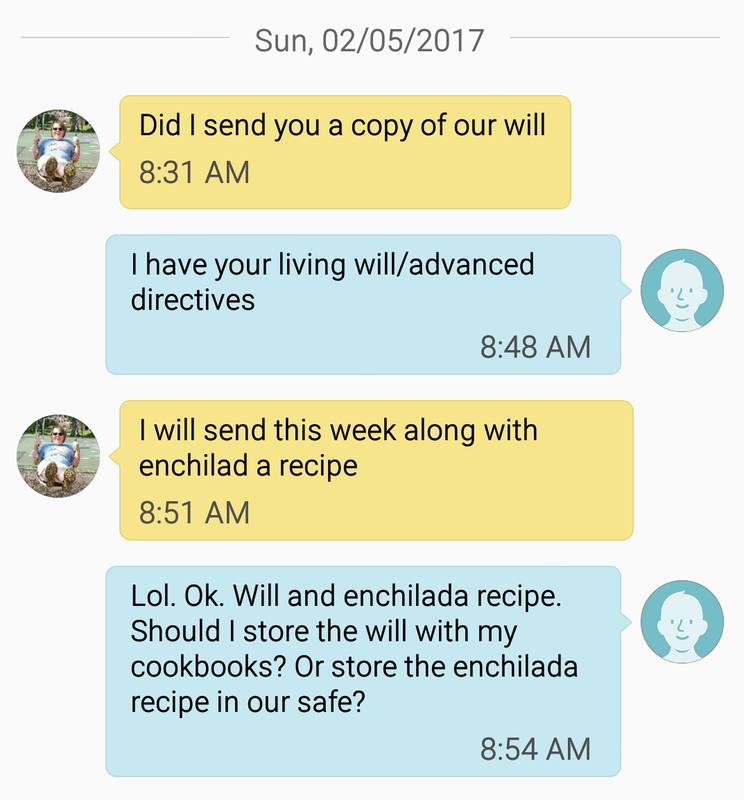 Like she writes, she's not planning on dying anytime soon. But she's pragmatic about death– Dad "We're all gonna end up dead one day" Haller is, too. When I tell friends about these regular exchanges my family has about death and dying– they look at me as if my face has suddenly sprouted a foot. And I get it. Death is such a taboo subject in our society. I know the fact that my siblings, parents and I have this ongoing dialogue about what we do and don't want in our final moments and what we'd like to happen to our bodies is unusual (most of them want to be cremated and sprinkled some place peaceful and beautiful– the mountains or the ocean. Steve wants a Viking Funeral. I'm kind of digging the idea of this Mushroom Burial Suit). Maybe we're weird. Unsettling. Too dark. All those things. But I don't think it should be. I'll put the mushroom death suit and cremation aside for the moment (being flip is just a reflex– attempting to find humor in the inkiest corners). I understand death is maybe too morose for a rainy Monday. I'm a regular person, too, who (like everyone) is apprehensive and fearful of death– the loss of my family and friends– my own end. But can't we all talk about death without it being morbid? Can't we stop pretending that we're immortal for a minute and acknowledge the reaper in the room? We'll start with the obvious and inevitable. We are born. We spend some time here. And we die. It's the universal narrative of our existence. So short it makes all the middle part seem insignificant (it's not). We take so much care with the first part. In preparation for new life we read books, download apps, take classes, scour message boards. Track each stage from poppy seed to watermelon with joy and terror. We have endless conversations with our partners and friends and family about what that new life might look like. Who it might act like. What its future holds. There are parties, balloons, cake. Weird games involving melted candy bars in diapers. And it's all understandable and appropriate (well, except for maybe the diaper game). My heart bursts at the site of a new mother and her new baby. Because I know. I know how precious and life-altering it all is. There's not the same fanfare surrounding death. And I'm not suggesting there should be. It's a different sort of creature. But there should be something, you know. Something ahead of the wake and funeral. Something after. When Elizabeth Gilbert took the stage at the retreat that first night last week, telling us about how ill her partner was. How it seemed the end was near, she pointed out something that stuck with me. Rayya is dying. I mean really, we're all dying the minute we start living. But for Rayya, it is closing in. What Liz lamented was how near it was for her dear friend and we didn't have the right verb for it. That moment infants travel from the womb to the world they're being born. But what about at the other end of the timeline? What would that be? Being died? We don't have a vocabulary for the last weeks, days or hours of a person's life (those whose death is the result of a long-term illness, anyway, as so many do). We can't locate the words to sort through the enormity of this moment. And so I think we run from it. We duck in an alley. We change the subject. But shouldn't we approach death with the same care and planning we do for life? With the same candor? The same intention? When we avoid the topic, we're throwing caution to the wind. Allowing our death and the death of those we love to be up to other forces. I'm not talking about the cause of death– I understand we're not in charge of that. We don't really get a say in when or what kills us. But the "how" of death? The "Where" of it? We can have more of a say in that, I think. In it, the surgeon writes: “It is not death that the very old tell me they fear. It is what happens short of death—losing their hearing, their memory, their best friends, their way of life. As Felix put it to me, 'Old age is a continuous series of losses.' Philip Roth put it more bitterly in his novel 'Everyman,' 'Old age is not a battle. Old age is a massacre.' 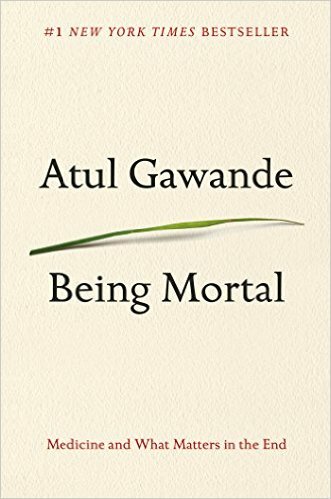 "
"The waning days of our lives are given over to treatments that addle our brains and sap our bodies for a sliver's chance of benefit," Gawande says. He points out that our lives are getting longer– but our ends are often drawn out and painful: punctuated by invasive medical treatment and intervention after intervention. Fifty percent of elderly Americans die in acute care. Passing away in hospitals hooked up to machines– with no agency over their bodies– their loved ones witnessing the final pained moments in the sterility of a hospital room rather than the comfort of their homes surrounded by the familiar smells, their favorite chair, their beloved pets. I pray for a death as beautiful as the birth of baby Liam, at home, surrounded by all those who loved him. It's the reverse side of the same coin, you see. Last weekend Liz Gilbert* recalled one of her last conversations with her friend Richard From Texas (the guy who nicknamed her "Groceries" in "Eat Pray Love"). Richard had told Liz that he'd had a couple of heart attacks. "I'm just getting used to letting it stop," he said. "He died peacefully in his sleep, at home, on a quiet Texas evening, after having taken a lovely stroll with a dear friend. He was found sitting in his easy chair, with his big strong hands folded gently on his lap. I have never heard of a more gentle passing. I don't think Richard was afraid to die, either. (I once asked him what he thought about death, and he just laughed and said, 'All I know about death, Groceries, is that it always seems to take everyone by surprise — which is weird, because it is LITERALLY the only thing the universe guarantees to everyone. Death is literally the ONLY explicitly clear item on the contract — but still, it always seems to take folks by surprise.' "
Can we stop being so surprised about it every time? I think it's traumatic for our brains and our bodies to be surprised by death. It literally happens every day. I'm not suggesting that we don't grieve. That we just get over it. Not in the least. But let's talk about it. Let's look it in the eyes and show it the same love and compassion we show a newborn. Death does not mean to scare us. It's just the natural way of things. There are examples for how we could reshape our dialogue about death. 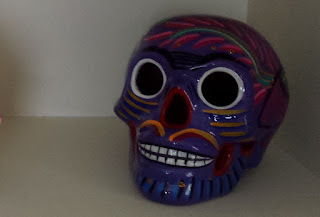 I love the "Day of the Dead" tradition in Mexico– where families clean and decorate the graves of deceased– leaving bottles of tequila, candy and marigolds. They keep alters in their homes as well, shrines to their loved ones. They share stories. I love how beautiful the sugar skulls are– transforming something grotesque into art. Transforming death into poetry. I love the tradition of jazz funerals in New Orleans– the dancing the music. A Dixieland Jazz Band played at my grandfather's favorite bar after his funeral. Even in death, Poppy always knew how to start a party. And I'm coming to believe that the quiet, steadfast souls who guide the dying from this phase to the next should be honored. The doctors,nurses and hospice workers who acknowledge that all the measures have been taken and it's time to let go. They care for the dying, not by trying to prevent death, but by comforting the dying and their families. Did you know there are people called Vigil Volunteers? They are individuals who sit with the dying and their families– sometimes they might sing or read. Often they just sit and listen. Their role is to be present. To witness a soul passing from here to there so no one has to die alone. They are living saints, I think. Their soothing presence a gift. And people like Liz, too, and my friend, Kristi who told her dear Jim it was OK to go. Those who support their loved ones when they decide to forego the endless treatment, who honor the DNRs other advanced directives. Those who offer steadfast companionship and support rather than insisting that all possible measures be taken. Those are acts of courage and grace. Once again, I find myself rambling. I feel like I should've had a better nutgraph (or thesis for those non-journalist types among you). The journalist types would no doubt have cut this post in half and rid it of all those unnecessary commas. "Life is so fleeting- I try to reminds myself of the fact every moment is precious because that is all we have. I then asked her if she remembered the song 'Dust in the Wind'. I suggested this song puts life in perspective- one moment there is life and then it is gone. Makes one appreciate the loves of their life and enjoy them while we have life." For your listening and viewing pleasure (the hair in this video is astounding– pretty sure my Mom shared it with the stylist when taking me to get haircuts in first grade). * Eventually I'll stop referencing my weekend retreat probably. But there is still plenty of stuff to mine through, so I apologize in advance for that. P.S. I created a page on Facebook for My Inside Voices– in case we're not FB friends but you'd like updates from the site. Feel free to give it a "Like".